I would like to hear opinion of rabonim sofrim and the SoferForum community, at what price range when selling ksav arizal tefilin do we have to be makpid on the roshei hashitin of the Ariza"l? I heard in the name of Rav Friedlander that if the buyer ordered tefilin in ksav arizal, the roshei hashitin *must* follow the order of the Arizal, and if not the sale is a mekach ta’os. I just looked it up. It seems the Shulchan Aruch Harav (siman lamed hay sif alef) is quite relaxed about roshe hashitin and it appears to be quite unimportant - hence my previous post. Since *many* consumers of Arizal ksav consider the Shulchan Aruch Harav seriously (not Just Chabad but other Chassidic groups who are the main consumers of Arizal), it therefore can be understood why so many sofrim and poskim are not makpid. My question is at what level quality do we have to be makpid-lets be clear tefilin beis yosef are 100 percent kosher as well according to all poskim, if somebody wants ksav arizal then why should it be only half arizal? Furthermore i feel the reason is simply sofrim are lazy or stingy to get a tikun arizal, and they write from a tikun beis yosef. This Forum is for all of us to get together and remind each other not to relax the old minhagim. 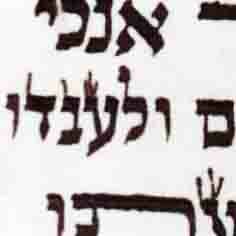 Ksav Beis Yosef may be kosher according to A"R and so is stumah Rambam. However it is clearly not the preferred way. The A"R writes clearly how to form the letters (like Arizal) and the stumah described is NOT like the traditional Stumas Harambam. However the Shittin issue (Number of shittin and roshe hashitin is firstly a kabala traditional concept - not like the tzuras haosiyos and stumos which is strict halacha. that is the first difference. Yet furthermore, when it comes to number of shittin and roshei hashitin, the A"R clearly differentiates between the two. The NUMBER of shittin is an accepted practice (4 and 7) (even though, if a sofer differs it is still kosher. Maybe this is somewhat comparable to say ksav B"Y or Stumah Rambam - Kosher but not preferred). However he clearly writes that to be makpid on the Roshe Hashitin is NOT accepted practice. So on both counts you cannot compare. All what I am writing here is solely my opinion. לכאורה, what the AR writes in the SA is according to "נגלה", so for AriZ"l or AR tefillin I would definitely say yes to be makpid on the ראשי שיטין. From reading the מצת שמורים, משנת חסידים, שער הכוונות etc. it is understood that each line in the tefillin has their own specific כוונה, therefore mixing up the ראשי שיטין would be mixing up the כוונות. Not that it is פסול, but it just won't be מהודר. Many people for some reason are afraid to write long letters (and therefore do very stupid things), and I never understood why. If on the last line of "שמע" in "של יד" you MUST write long letters (except Chabad) so there won't be 9 letters at the end of the line, so there should be no problem to write long letters in order to get the ראשי שיטין correct. And if done correctly even והיה אם שמוע in רבינו תם could be done without any major stretching. Rabbi chaim naeh holds that what the a"r wrote in piskei hasidur was not because the first was not according to kabalah but that it was what he was chozer in his later years so also the first is according to kabalah at least maybe according to this opinion one might be able to be makel. 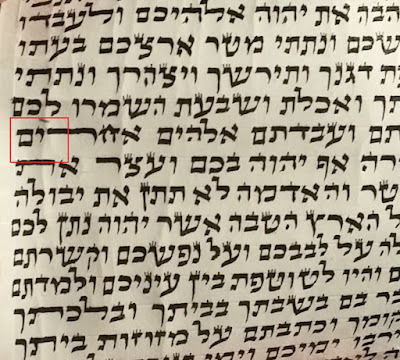 I think that the sofrim in these cases don't do this on purpose so it might be like a letter that is not arizal by mistake.The quetion is is that is this also speaking in a case of bedieved.Just like by beis yosef. 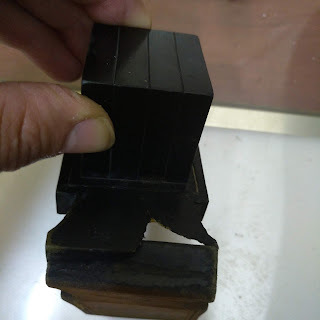 I think thought the question is does one have to tell the buyer (with all the paranoia with tefilin) I think the minhag is that it depends how much you are charging for the tefillin if you charge top dollar then everything should be perfect halachakly and also niceness. I think the minhag thought is not to be makpid. Just trying to be melamed zchus I think everyone eventually gets one time out of the line.I would prefer to put a letter on the line under and strech than have it sticking out to much. If you were to look in the sources(Shaar HaKavvanot and Pri Eitz Chaim) much much more space is dedicated to explaining the Roshei Shitin then the letters or even the Kavvanot of the Shem HaShem. Further if one were to follow the full Kavvanot that the Ari brings for writing Tefillin, each line has a certain number of letters and a certain Gematria that is very very important. So I would have to say that unless you use Roshei Shitin you haven't really written the Tefillin according to the Ari.